Browse: Home » 2013 » September » MAGIC AT EUBIE BLAKE LIVE! MAGIC AT EUBIE BLAKE LIVE! Jazz presenter Mike Binsky brought top drawer artistes Louis Hayes (drums), Abraham Burton (tenor saxophone), Steve Novosel (bass), and Larry Willis (piano) to the Eubie Blake National Jazz Institute and Cultural Center on Sunday, August 17th. As this was their third night in the area, they came in tight. The music was straight ahead, burning, beautifully done. 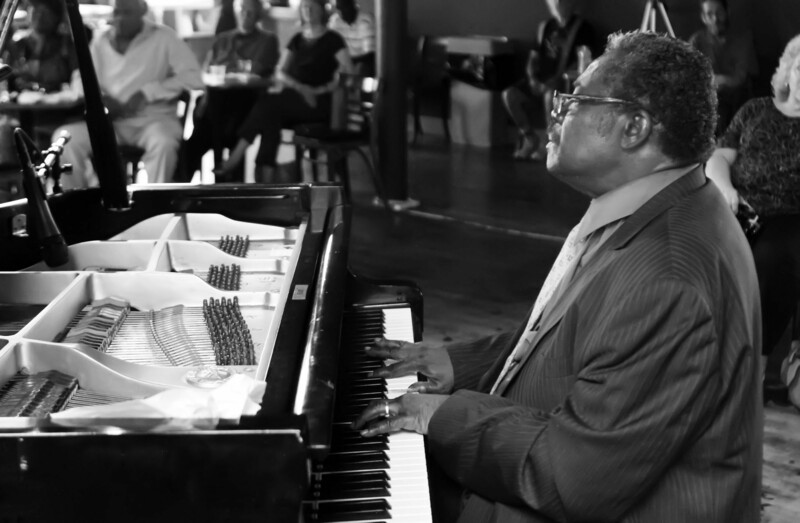 Mr. Hayes has been playing for over sixty years, but his mind remains quick and agile. He is a master musician with an adroit touch—relaxed, behind the beat. He played sans monitor, displaying dexterous sensitivity, musicality and fire. His accompaniment throughout was highly musical and intelligent, based on counterpoint, not parroting. His solos were masterpieces of melodic logic. Stylistically, it seemed as if he has listened to a lot of Max Roach and Philly Joe Jones when younger—what serious student of this idiom has not?—and his brush work reminded me of Papa Jo Jones, who mentored him after Hayes arrived in New York in 1956. I loved how he got right under the piano during Larry Willis’s solos, and how he built his accompaniment for the bass solo gradually, starting on closed hi-hats, regulating pressure and volume with the fingers of the left hand, gradually increasing the energy as the solo progressed. He played with—not behind—each soloist, interacting in counterpoint. He switched cymbals behind soloists, favoring the 20″, with more spread, under the piano and the more defined 22″ for the saxophone and bass. He used the bass drum primarily for accents, and lightly at that. He really took his time on his three-chorus solos—very patient with no wasted ideas. Set one opened with “Village Green” (from Elvin Jones’s Putting It All Together), and the band traded burning eights toward the end. “Stella by Starlight” followed with a rubato sax solo before Hayes swung it in. Burton was fiery, logical, feisty, and substantive. Hayes had the snares off in the bass solo, so there was no low-end sympathetic buzz. Willis then started an exquisite treatment of “Old Folks.” Hayes played brushes at first—killer sweeps—deep Philly Joe and Papa Jo. He used sticks under the saxophone, elevating the energy. Hayes began “The Night Has a Thousand Eyes” with a left rim click muffled snare head figure; I thought it might have been his take on “St. Thomas,” but no . . . the groove changed to swing at the B section. “No Blues” elicited hand claps from the audience. Hayes played understated snare quarter notes during the piano solo before building to a shuffle. In the bass solo, he laid out on chorus one, played brushes during chorus two, and sticks on chorus three. While changing from brushes to sticks, he played quarter notes with the left foot to maintain the pulse seamlessly. Steve Novosel’s strong pulse, great time, intonation, mastery of the idiom, pocket, and strong solos were evident throughout; these skills are why he is at the top of the heap among upright players in this area. Hayes opened set two with “Invitation,” implementing a hip little 6/8 figure, different from what I’ve heard anyone else play on that tune. This tune had a nice, wide, relaxed cymbal beat. Then Willis practically rewrote “If I Were a Bell.” His intro was a thing of great beauty and humor, and Burton contributed energy and creativity. An extraordinary rendition of “My Funny Valentine” followed, during which the audience was spellbound by Willis’s passionate interpretation. Following Hayes’s “Mellow D,” a relaxed blues, the show closed with a high-velocity version of “Eternal Triangle.” It was the only really up-tempo burner of the evening. And burn it did. The venue is a fine room, with good acoustics. Initially the sound was rough, but it improved before the second tune. The piano had been tuned that day, indicating a certain degree of respect for the music, players, and audience. The food was excellent and reasonably priced. Great musicians, great performances, great venue, nice food, free parking—we’ve got to support these!